The moon famously went pink last night, and so did my moths. I wanted to see the eclipse of the 'supermoon' and managed to wake myself up at 1.30am, 2.15am, 2.45am and finally 3.30am when the eclipse was under way. 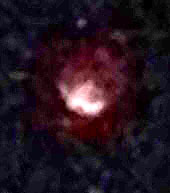 Sleepiness and the limitations of my iPad mean that my photographic record of the great event is rudimentary. 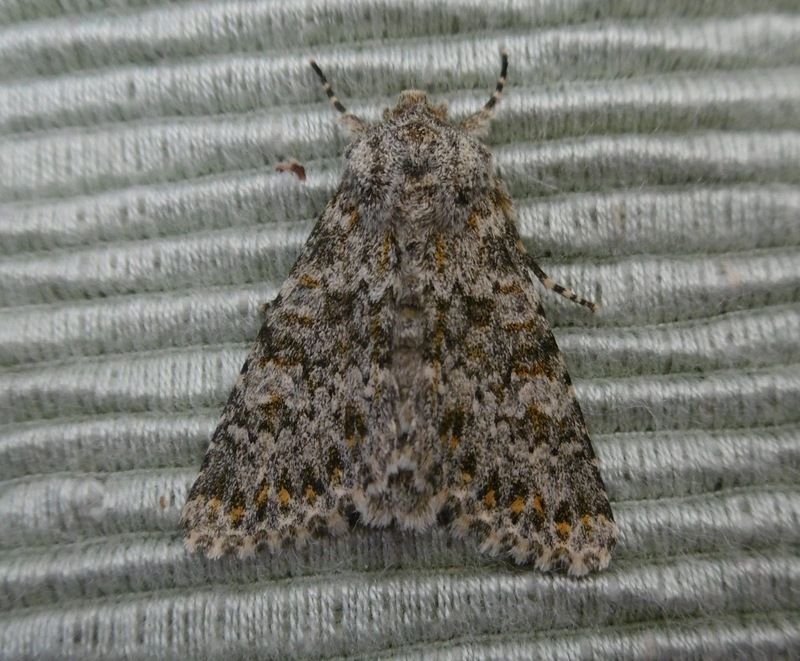 But there was a nice coincidence in the moth trap this morning. 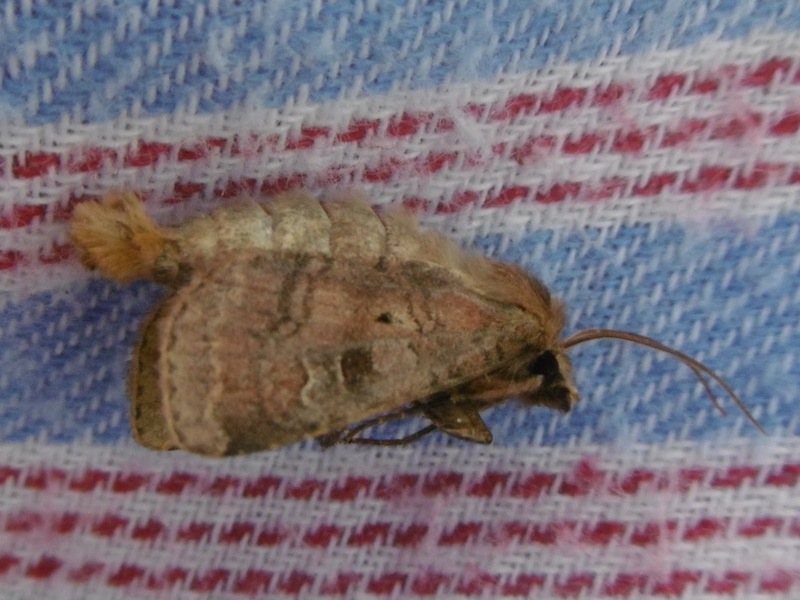 Three Pink-barred Sallows had arrived, my first of this year. They couldn't have chosen a more propitious night. I've now had the Sallow, the Centre-barred Sallow and the Barred Sallow. 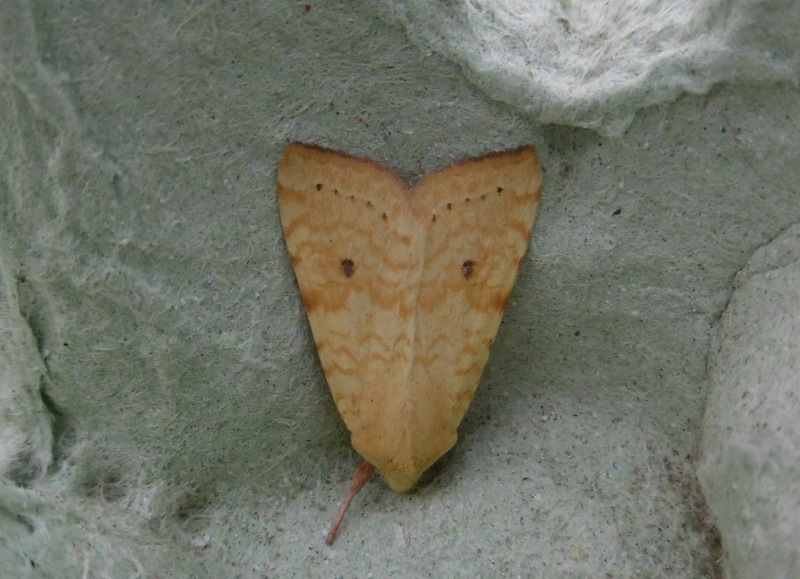 The Orange Sallow, the Dusky-lemon Sallow and the Pale-yellow Sallow have yet to make it. The last is very rare, so I'm not expecting it. But you never know. 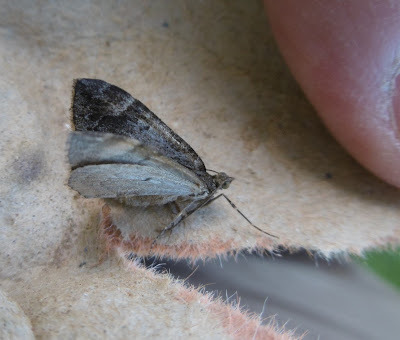 Also there among the Lunar Underwings et al was this nice Snout moth. It always puts me in mind of Pinocchio, and I do not tell a lie. 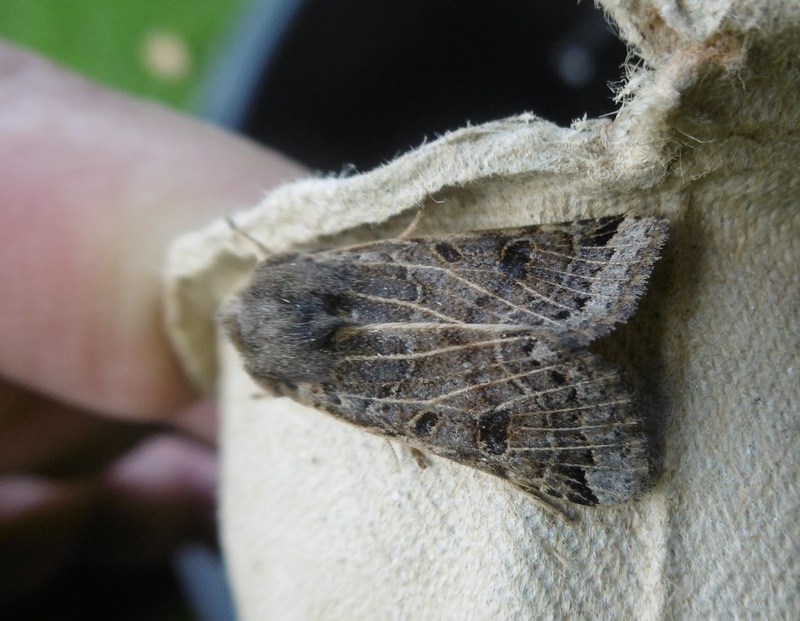 The nights have got colder and the moth trap's contents have settled into routine mode, with the likes of the Black Rustic and Lunar Underwing coming in good numbers, along with a dozen other familiar species. So it's been down to Penny the World's Leading Outside-the-Trap Spotter, to come up with the goods this time. 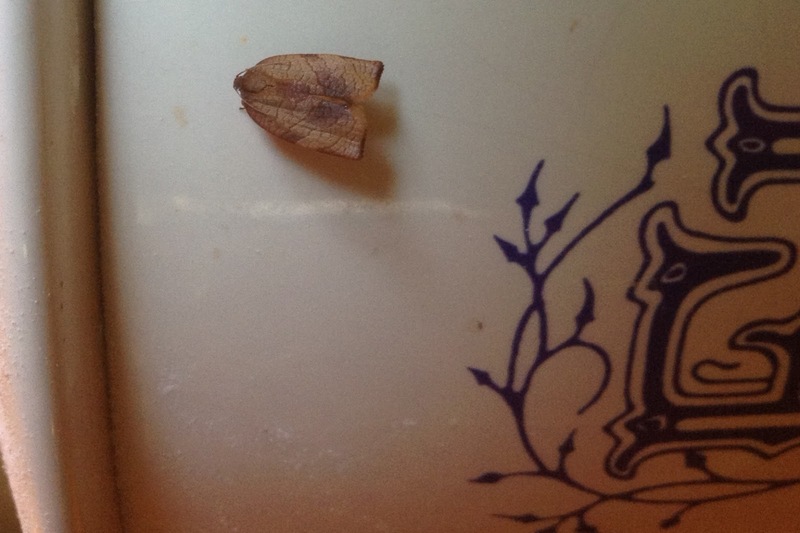 She spotted the little chap in the top two pictures on our flour jar - or should that be flour pot, as opposed to flowerpot)? At first, because of the heart shape, I thought it was what I call the Valentine moth, Acleris forsskaleana, which can have a second brood around now. 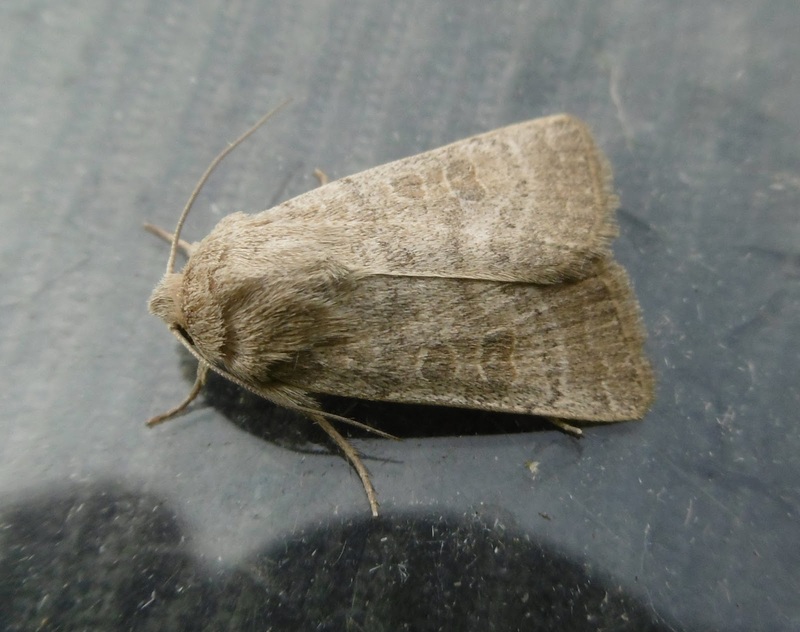 But a closer look at the patterning and the wing shape convinces me that it is one of the lively family of Carnation Tortrixes, Cacoecimorpha pronubana, who live in our greenhouse. 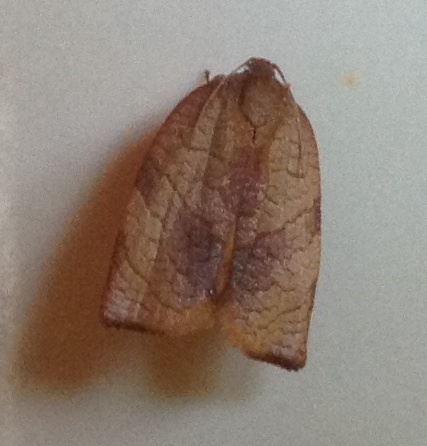 By chance, a rather similarly coloured micromoth spent the night in the trap. 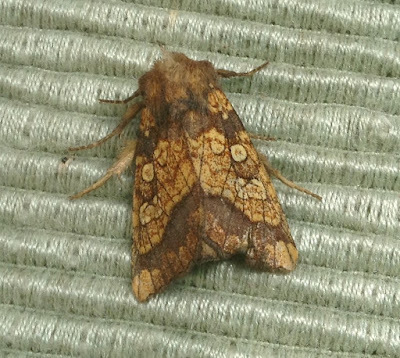 I think that it is a Light Brown Apple moth, Epiphyas postvittana, which is a stalwart here and no doubt enjoys our apple trees. 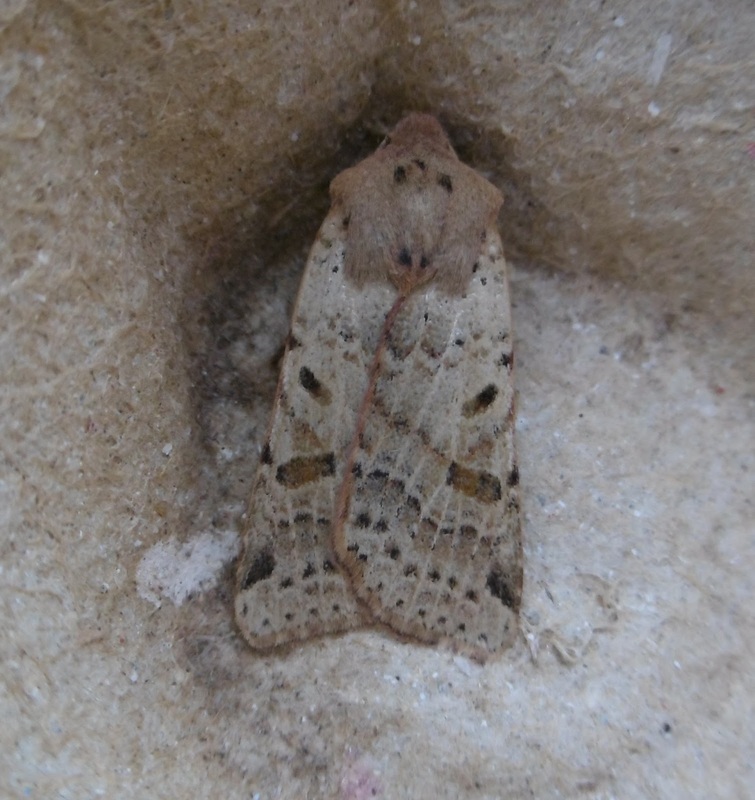 Back to Penny, and she did well to spot this Large Ranunculus, below, sleeping just under our porchlight, along with two Lunar Underwings, one grey and the other brown but both very well camouflaged. 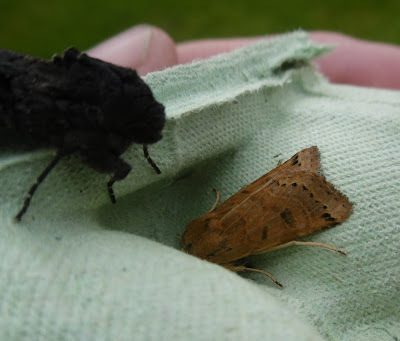 I was a bit of a Penny myself when I went to inspect the moth trap. I usually check out its surroundings though my thoroughness depends on how sleepy I am feeling plus the competing call of early morning tea. 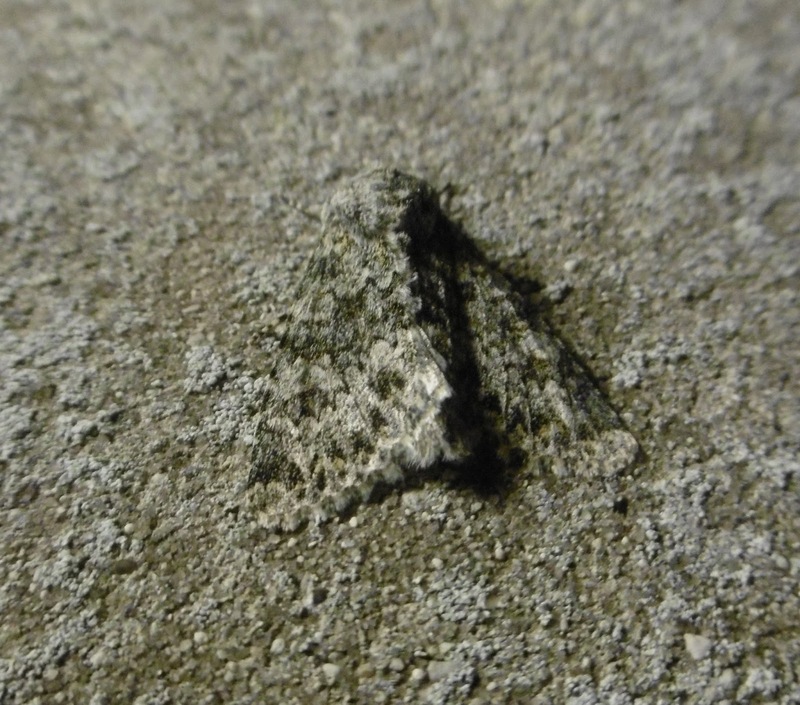 On this occasion I was quite alert and spotted these three Black Rustics on the wall and grass. While checking the eggboxes, I had time to take this photograph of a flimsy little carpetty moth, but it fluttered away before I could take a more illuminating shot. 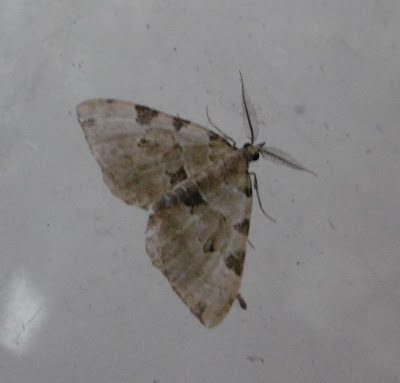 Dave Maunder on the endlessly excellent Upper Thames Moths blog has come to my rescue by ID-ing it as a Common Marbled Carpet. Moths are generally very samey when it comes to resting positions. When Penny and I came in last night, she (the unparalleled moth-spotter where insects outside the trap are concerned) noticed three of them sleeping happily in light drizzle below our porch light. 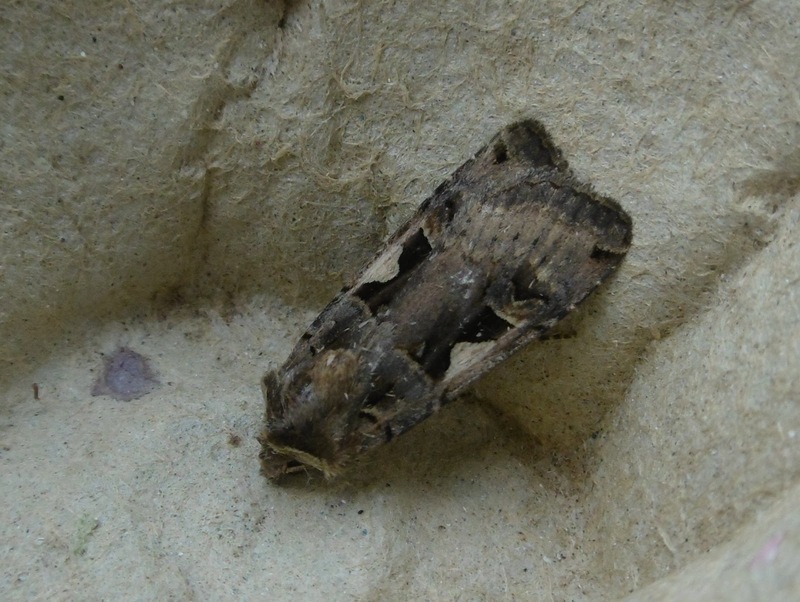 All formed neat little triangles with their bodies and underwings well hidden even though they were otherwise very different-looking species: two Lunar Underwings and a Large Ranunculus. 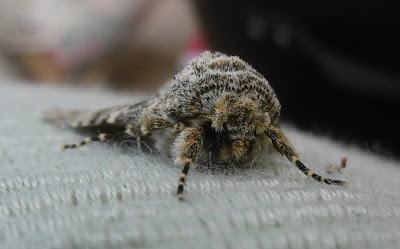 Today's moth is different. 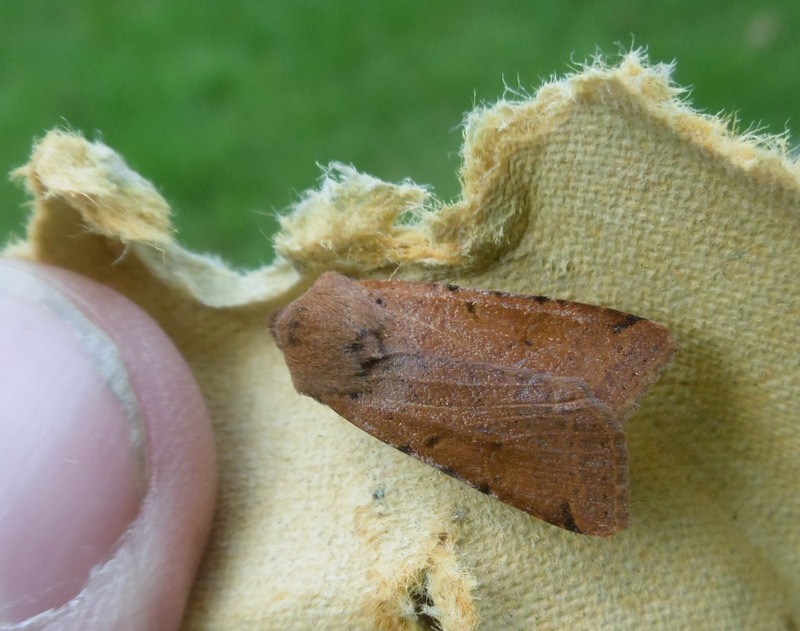 One of the many Square-spot Rustics around at this time of year, it had pegged out rather thoroughly on the base of the moth trap's bowl. Update: I think today's commentor is right to re-identify this as a Small Square-spot. Many thanks. 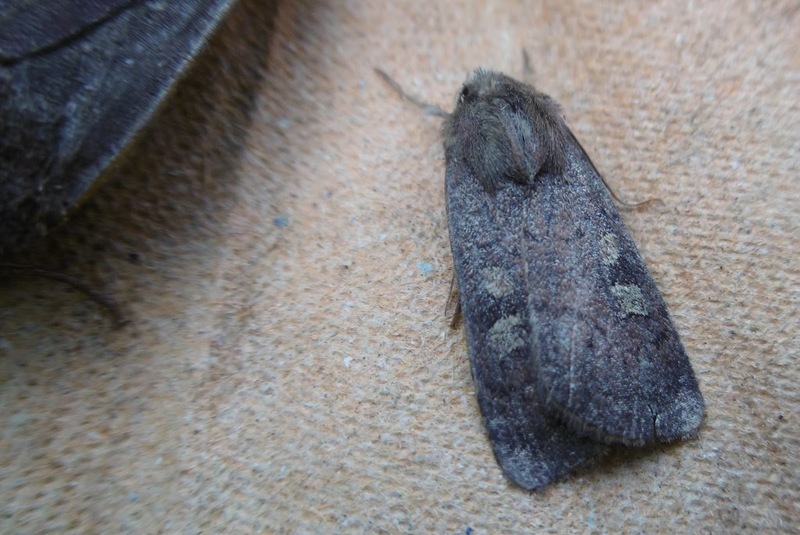 In the process it revealed its thickly tufted tail. When photographing moths, you get used to seeing a mop of hair or fur on the heads of recently-hatched specimens, which have yet to undergo the rigours of life including hair loss. But many are well endowed at the other end too. It is just that this feature is seldom seen. 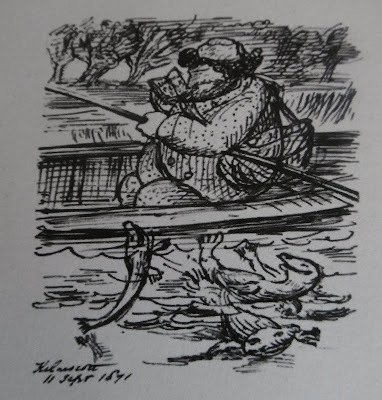 If it was, this creature might be nicknamed 'Tufty', just as William Morris was known to his friends as 'Topsy' because of the impressive thatch on top of his large and imagination-packed head. I learned this satisfying fact only yesterday on a hugely enjoyable first visit to Kelmscott Manor which I can't recommend too much. You are never too old to discover new things. Here is a cartoon of Topsy fishing in the Thames which runs alongside the Manor's grounds; like the Disciples, he is drawn by Dante Gabriel Rossetti innocently casting his bait on the wrong side of the boat. 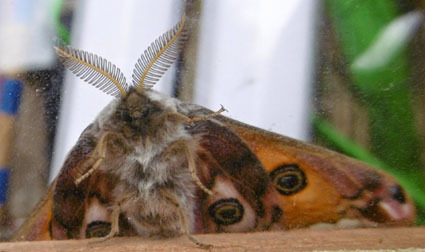 Another visitor more observant than me kindly pointed out the (deliberate) butterfly reflection of the stair lamp. And among May Morris's treasures in a cabinet upstairs, there was a lovely foreign hawkmoth preserved, a variant I think of the Striped Hawk. Willow and Sallow abound round here, with both a river and a canal within an easy walk from the garden. 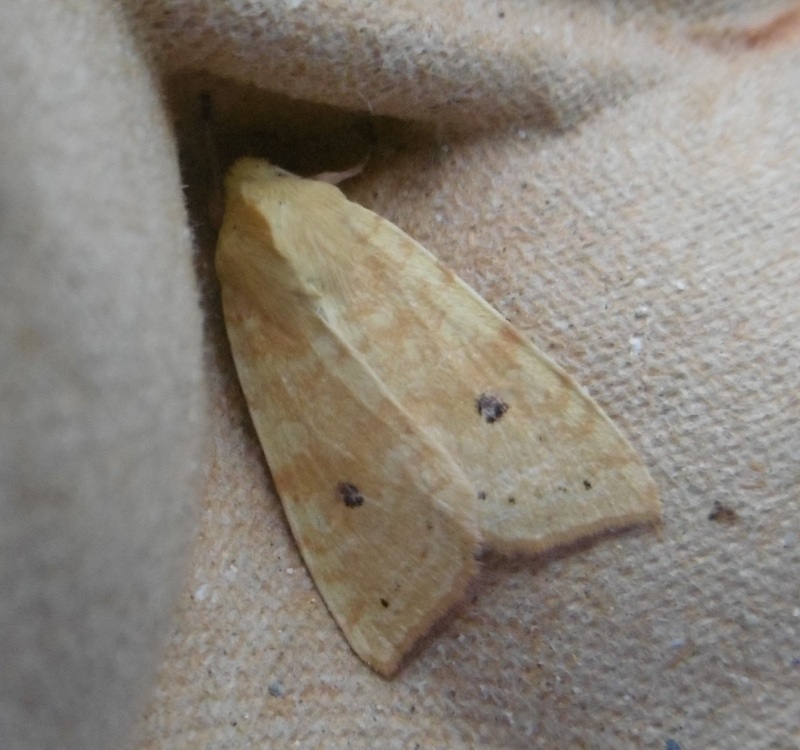 Not surprising, then, that we are visited regularly and in large numbers at the moment by the Sallow moth. What may surprise some readers, however, is the variability of the Sallow. My first three pictures are all of this species, in descending order of strength of colour in the creme caramel pattern. 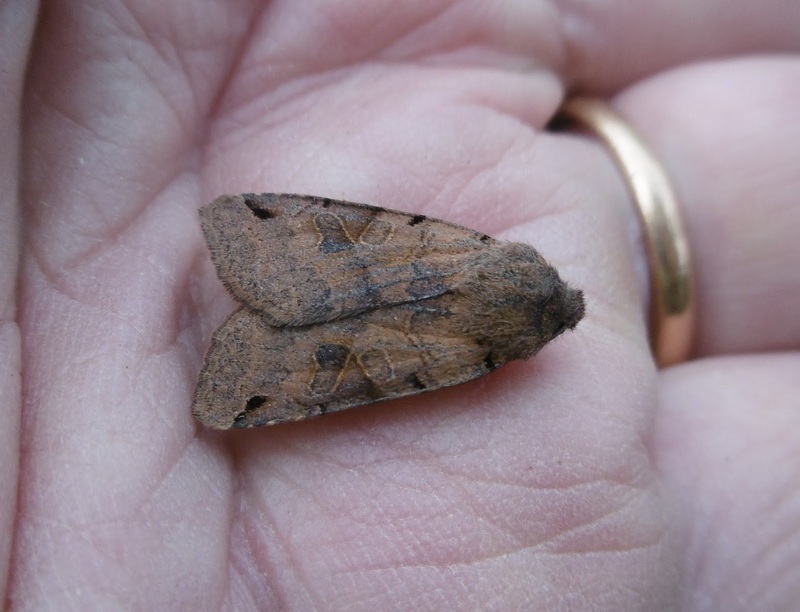 Another moth which is very common in the trap at the moment shares this range of colouring within a single species: the Lunar Underwing. 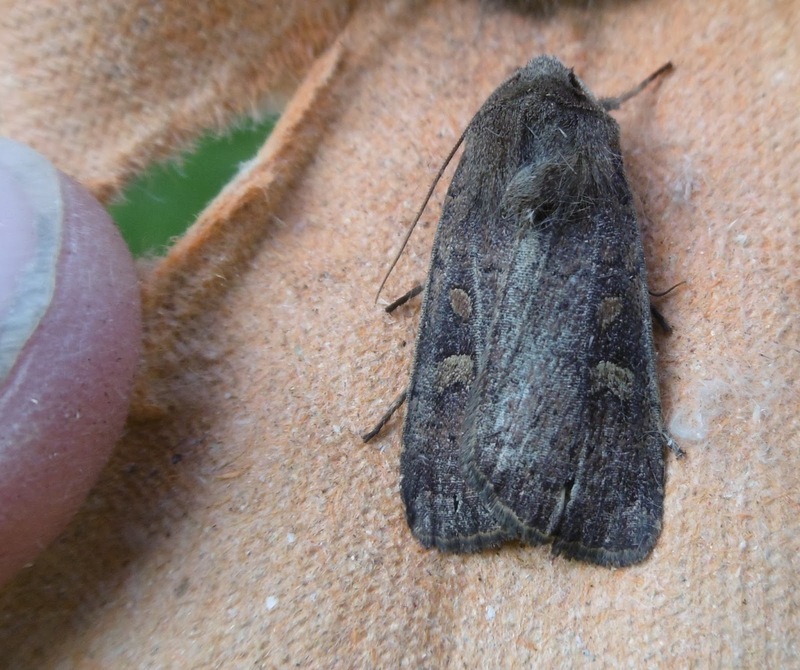 The next four pictures are all of Lunar Underwings. I wonder if they find humans disconcertingly different in appearance. 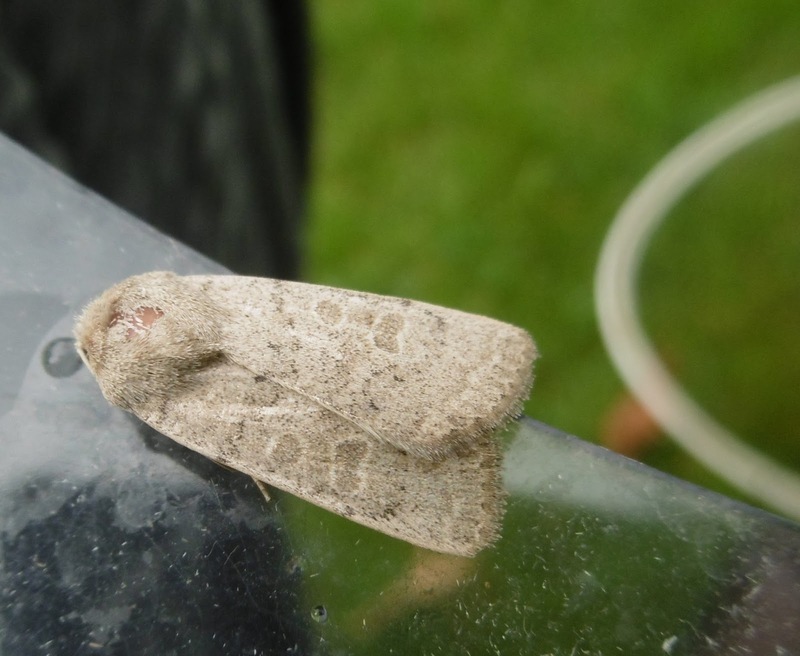 Good to see a handsome Silver Y perching proudly on the bowl top, meanwhile, with a very washed out Green Carpet on the canopy. 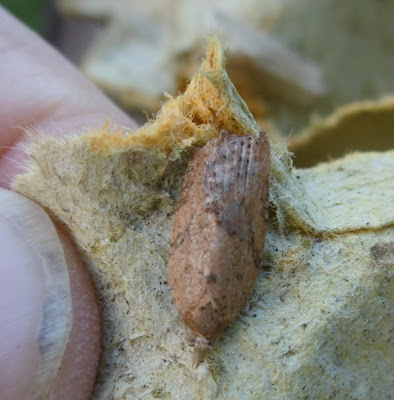 Finally, I think our micro moth representative today is a Bee moth, aka Aphomia sociella, Its name derives from its habit of nesting in old bumblebees' nests, where its caterpillars can be found feeding off the remains of dead former inhabitants. Update: I think that both Trent and the commentor on the next post are right to say that my 'Bee moth' is actually an immigrant species, the Rush Veneer. Many thanks to both. 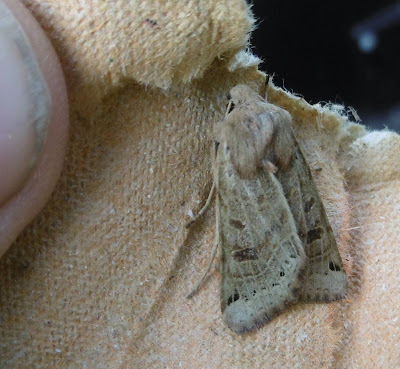 I'm conscious that because I like new and shiny things, like some sort of magpie among moth enthusiasts, I make too many dismissive remarks about brown and grey moths of middling size. 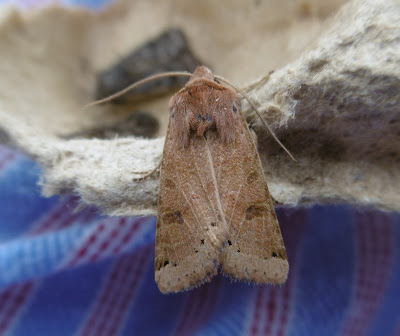 Anyone involved in moth trapping and study will secretly sympathise, I am sure, because a score of eggboxes full of Large Yellow Underwings and Square-spot Rustics can be a dispiriting sight. 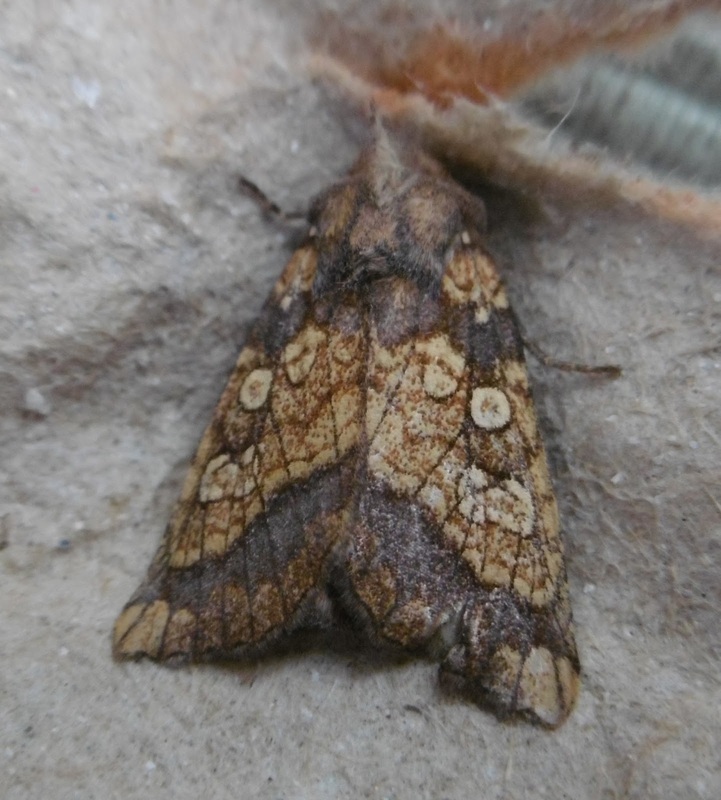 However...as these pictures show, I hope, the unexceptional can be beautiful too, starting with the Beaded Chestnut at the top (which may alternatively be a Brown-spot Pinion but I don't think so), followed by the Vine's Rustic above and below. 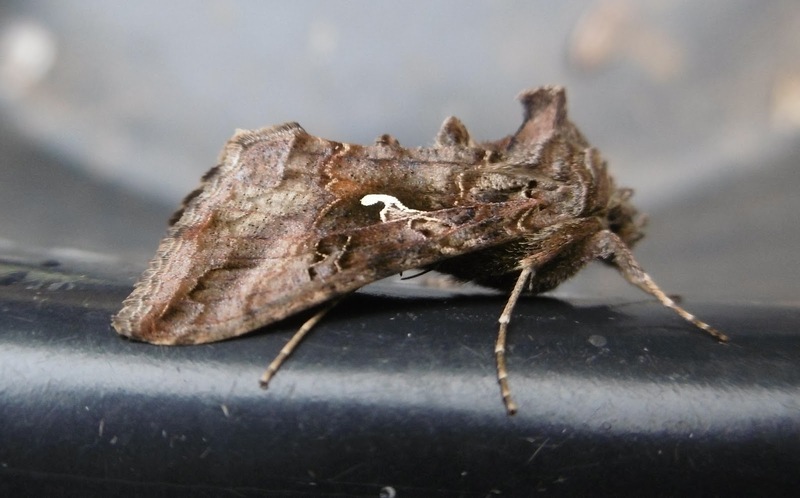 I say 'Vine's Rustic' confidently and I hope that I am right in both cases, but you can see if you look carefully that the patterns on the two moths are not exactly the same. 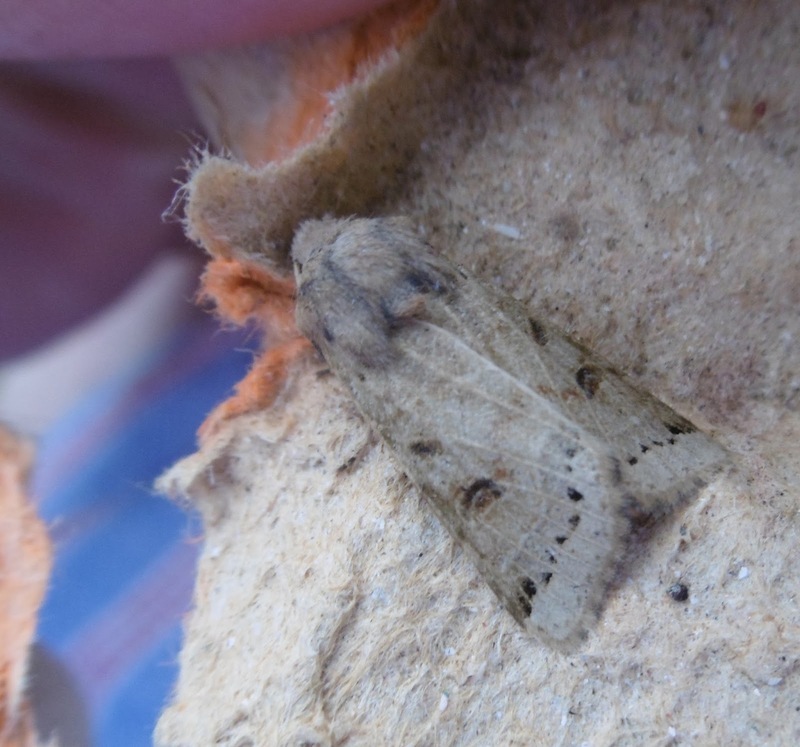 this may mean that the top one is a Pale Mottled Willow, though I think not. Or, more likely, it is an illustration of the variation in colour and/or pattern within a species, which is another reason why I find these types of moth so trying. 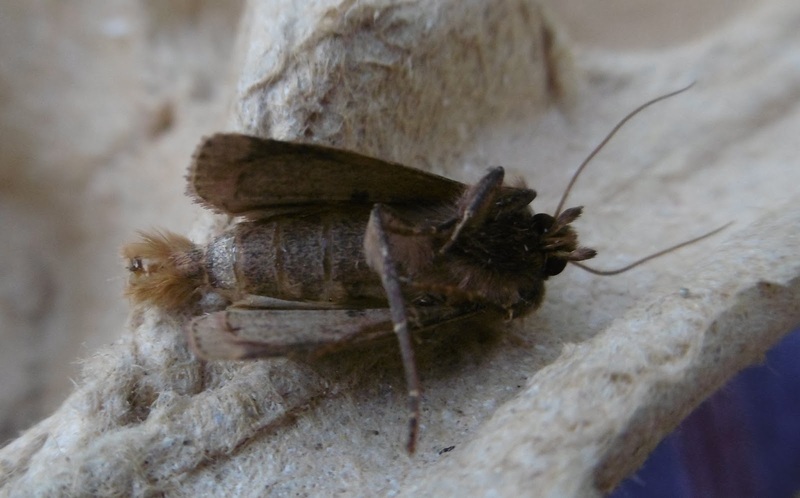 The next moth is not a problem: a Setaceous (or 'bristly' - but why as it doesn't bristle in the least?) 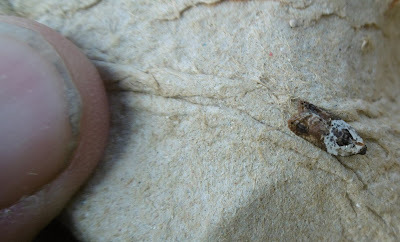 Hebrew Character. The Hebrew Character is the dark mark on the wings, something like a diabolo, which very much resembles the Hebrew letter 'nun', effectively an N.
Equally unmistakable is the Rosy Rustic below. 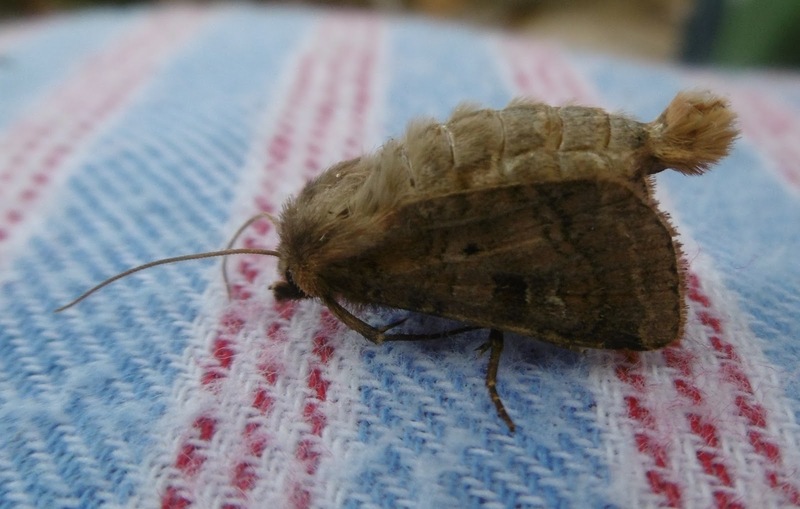 Now this is a really lovely moth, for all its superficial brownness and average size. 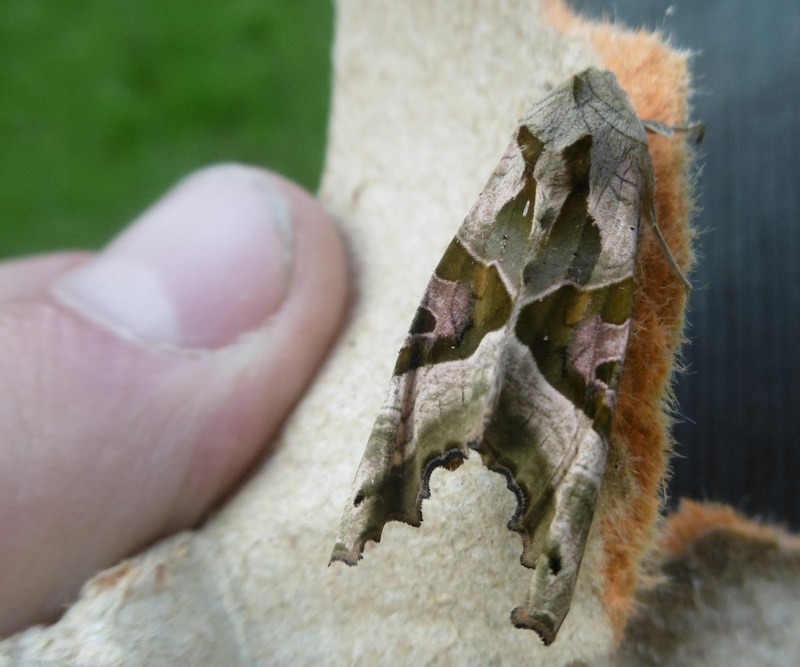 It is well worth double-clicking on the picture to see it much-magnified and admire the subtly pink and olivey-green tones. 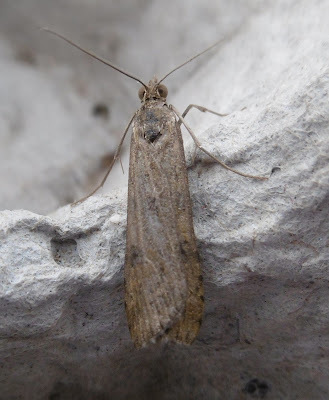 I haven't featured a micro-moth here for a while, although there have been plenty in the trap but all of them familiar. By way of penitence, here is a Garden Rose Tortrix, Acleris variegana. I am sure that the Garden Rose Tortrix micros absolutely loved that one. It certainly had a delicious scent. Although it's in flagrant disregard of my late mother's warning that 'there's too much swanking in this family", I can't resist giving a tiny plug to my own triumphs: second in the Men Only Baking with a frankly inedible Swiss Roll. 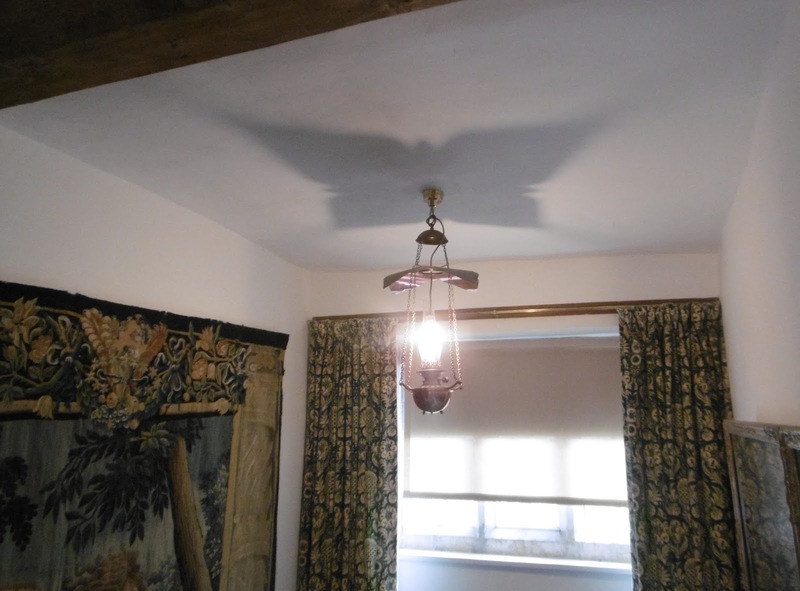 A neighbour said that there were only four entries and two were disqualified but I cannot believe that this was true. (We couldn't go on the day cos of people coming to lunch). And a second for my wild flower arrangement on the theme of the 2015 General Election. The big fat artichoke represents Alex Salmond. 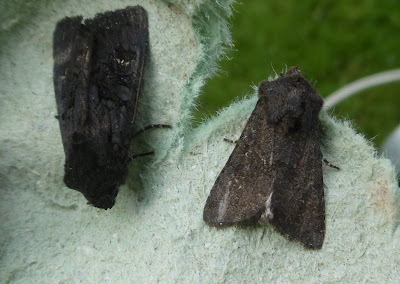 And finally... A Black Rustic on the left, a handsome beast as lauded two posts back. 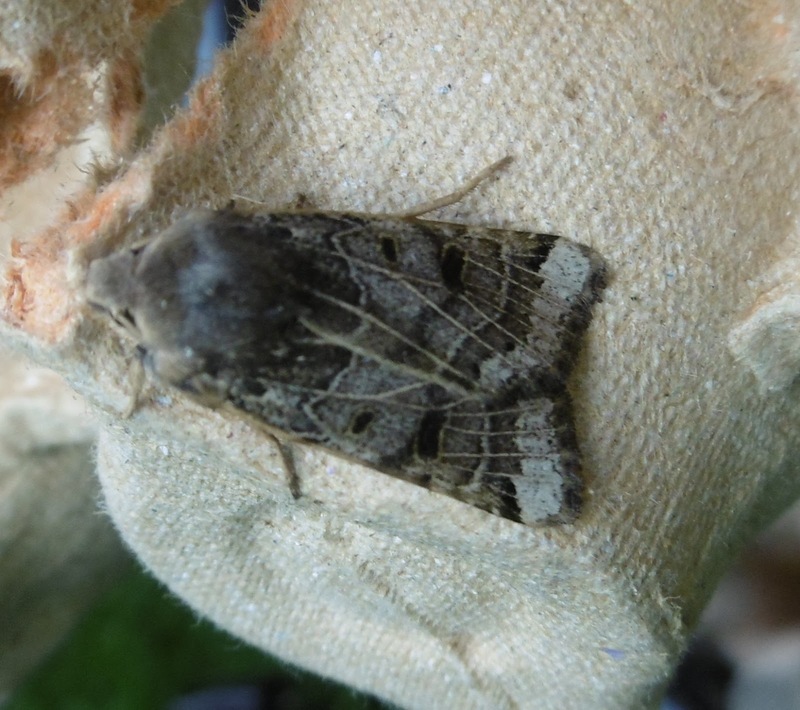 And alongside it, an....Umm..Ummm... Is it a very dark Marbled Minor? I am off to the moths books for help. Update: But Ben has got there first, in Comments. 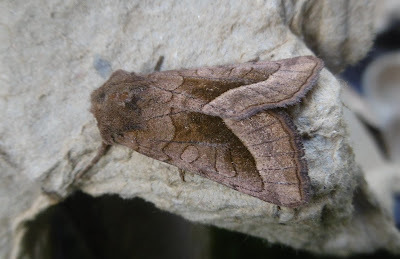 It's a Deep Brown Dart. Thanks ever so much, as ever. 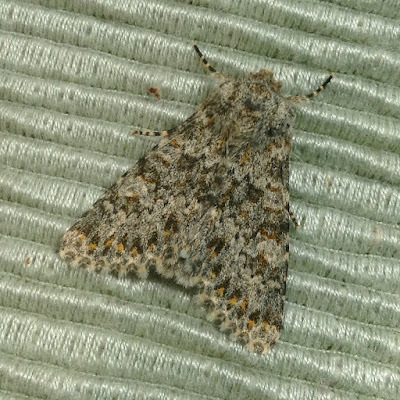 Not content with sending me the lovely Large Ranculus and Frosted Orange the other day, Mother Nature (or Mother Moth at any rate) added further joy and colour in the trap last night. 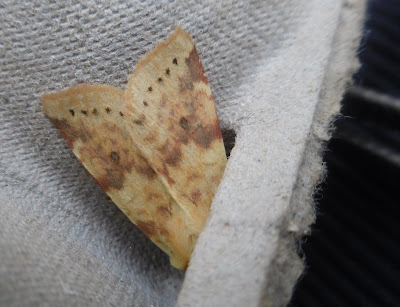 My first Bordered Beauty of the year, above, was resting serenely on an eggbox base, one of the loveliest of the UK's moths with its glorious combination of colours and pattern. This is the archetype of moths which have influenced fashion designers. Imagine that as a dress. 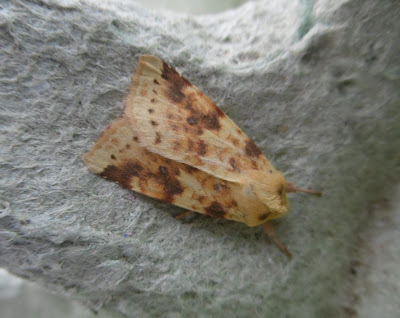 The Sallow is another newcomer for the year, lemony pale in its version of yellowand orange with small dots and dashes adding extra interest. Finally, a large Red Underwing was sitting unmolested on the trap's plastic shield when I pottered out at around 8am. 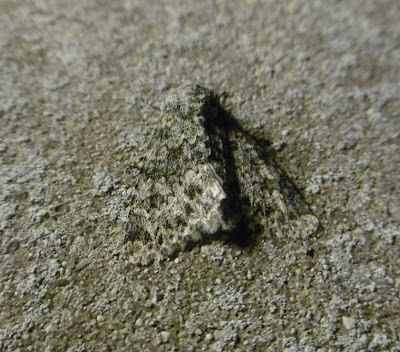 Its camouflage had protected it from the birds. 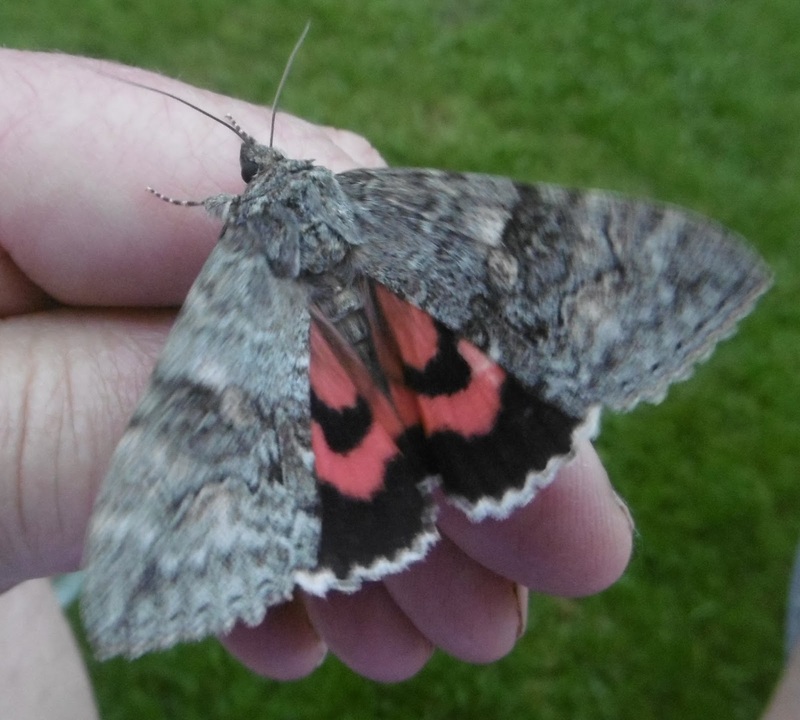 I always enjoy tickling Red Underwings to encourage them to show their bloomers, as this one did. Eventually it had hd enough and flew powerfully away - the size of a small bat and for that reason, maybe, still preserved from the bitds which were just getting active at that time of day. 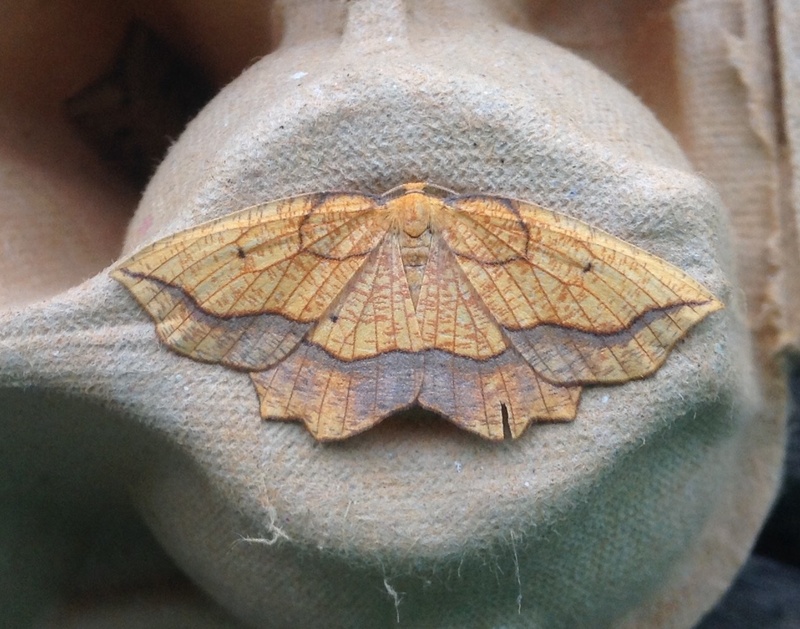 It rained yesterday evening and it was raining again this morning early, but in between times three of my favourite Autumn moths flew in to spend the night. They are all lovely or handsome in their different ways, but I think that I feel most excited about the Large Ranunculus, the subject of my first few photographs. The colouring of this sizeable moth is beautifully subtle, with little specks of ginger among the greys and greens, adding something extra in much the way that the eponymous spice does with cooking. The moth also has a characterful bristling 'face' and pleasantly striped legs. Altogether a joy. The Frosted Orange is also an extremely cheering sight among the worthy but relatively dull regulars at this time of the year: Large Yellow Underwings, assorted rustics and the like. The balding head on my second specimen (of four in the eggboxes) shows that they have been around for a while, but these are the first to pay me a call this year. 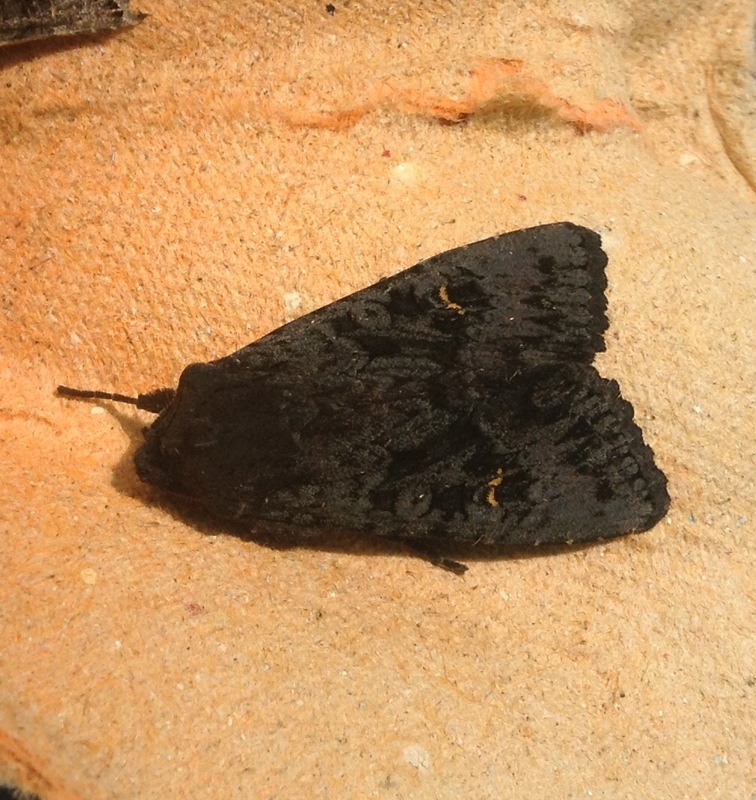 Finally, the Black Rustic is a very old favourite of mine and I have compared it to Darth Vader on endless occasions. 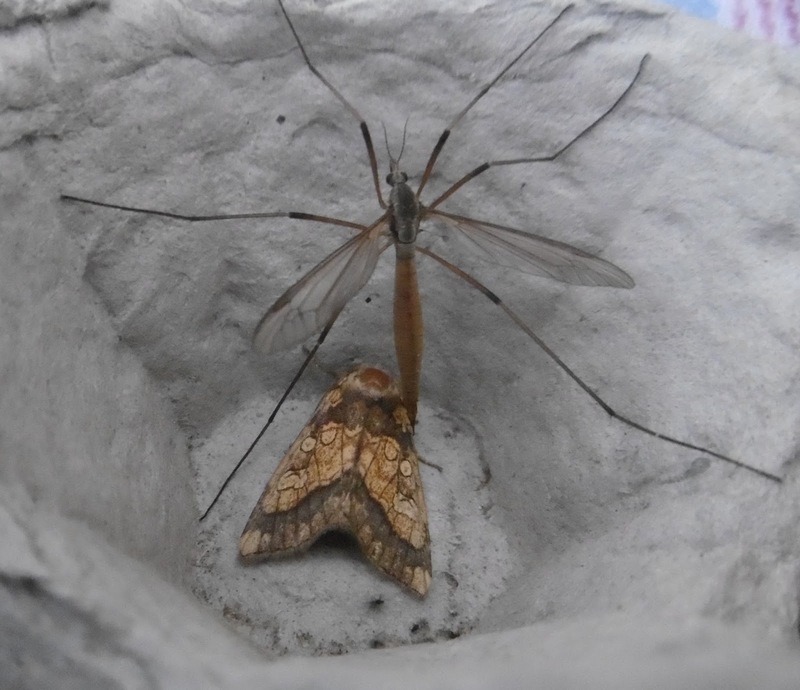 All three moths were so contented that they were still in the eggboxes when friends arrived for lunch. 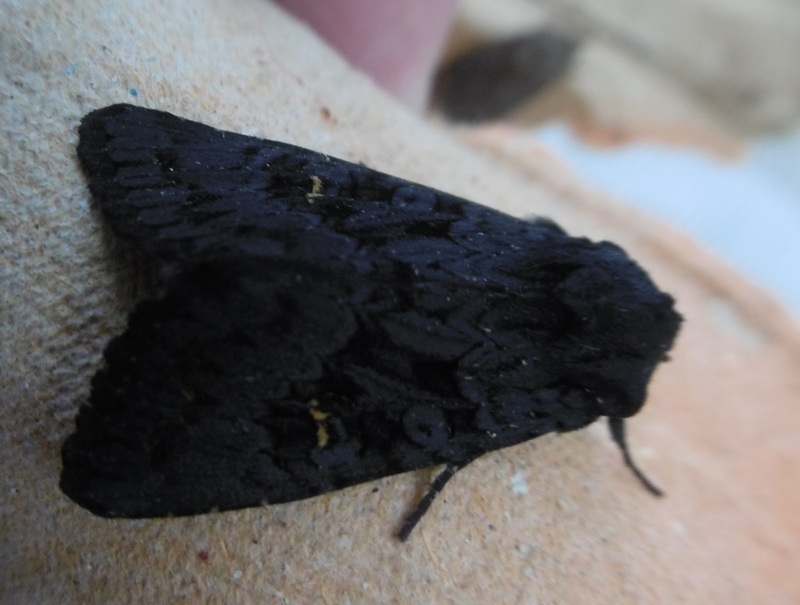 By that stage, the sun had come out and we were able to enjoy the subtle and varied patterns of slightly different but all velvety blacks which make up the Black Rustic's superficially monochrome wings.